Can you think of all the ingredients you might need to make a cake? There are lots of different ingredients such as flour, jam, butter and milk, hidden in this crossword puzzle. Can you find them all and maybe have a go at making your own cake? 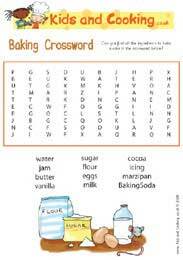 Why not Download the Baking Crossword Puzzle right now and see if you can discover all the hidden foods. This activity is aimed at 4 to 7 year olds, it's a fun way to help children learn a little something about cooking in the kitchen, as well as building their reading and recognition skills.